The Great Wall of China weaved its way through the horizon in the slowly setting sun. The mood was lighthearted, magical, but the first gust of wind swooped in and chilled me to the bone. I looked up at the looming wall now standing out against the dark sky and realized with a shutter, that this would be my home for the night. There was no time to waste, so our guides ushered the group of seventy students I was sharing this ex perience with forward until we were at the base of a mountain. I pointed the dim beam of my hand-generated flashlight up and saw only an endless path of steps. Single-file, we began to climb. The trees surrounding us were covered with a fresh layer of snow. Icicles hung from their branches glistening in the light of the moon. The sky was littered with glowing stars, the kind of night sky you only see miles away from civilization. I got lost in it, this picture of nature’s pure beauty. But I only risked looking up once. My eyes had to remain focused on the decaying steps I was climbing. 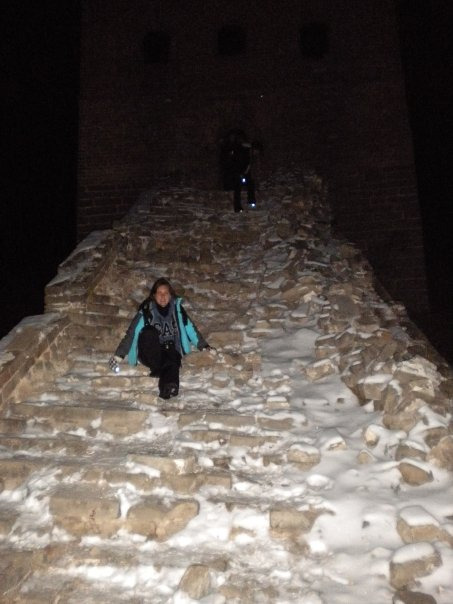 Forty-five minutes later I had made it top of the Great Wall. I looked down at the Wall which was composed of loose rocks and uneven steps. In most places the actual wall had given way, and I could stand on the edge and look down the side of the mountain. Patches of snow and ice layered the ground. I hadn’t been walking on it for more than two minutes when I fell. My foot hit a patch of ice and it was downhill from there, literally. I slid 10 feet before I stopped. My second fall came only thirty seconds later. I used my hands to push myself up, but the rock gave way beneath me and I toppled back to the ground. Five falls later I didn’t think this was so much fun. I kept my eyes down watching where I was stepping next and some how made it to the watch tower where we would be spending the night. I didn’t have a watch on so I wasn’t sure how long it had taken me. But by the time I reached my destination I had taken off my gloves, hat and jacket, and was covered in sweat. I had hiked so long and hard that I wasn’t cold any more- and that’s saying something. I made my way to the pile of sleeping bags and grabbed two. 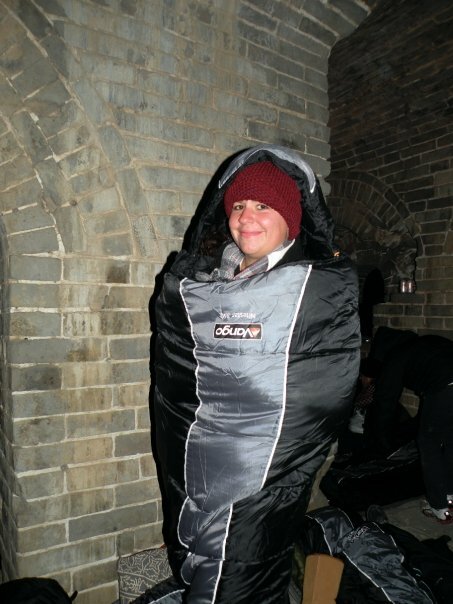 I found a quiet corner in the watchtower and got in my first sleeping bag, boots, jacket and all. Still cold, I pulled my second sleeping back up over the first. As I lay on the ground in my cocoon I could still feel the freezing ground under my back and hear the wind whistling above my head. I shook uncontrollably from head to toe. I was not alone in that. I could hear the sound of teeth clattering throughout the tower. I pulled my wool hat over my eyes and wrapped my scarf around my face. I closed my eyes and prayed that sleep would come soon, and it did eventually. I awoke very early the next morning with a dry mouth, and reached for the bottle next to my bed. The water in it had turned to ice. I stepped outside the tower as the sun peaked it’s head up from behind the mountains. I looked at the scene before me. The Wall stretched as far as the eye could see, winding back and forth like an ancient serpent. And as the sun made its way up to its place in the sky, it melted the “wow” moment out of me. My time on the Great Wall of China had been an experience, but I could say that about eating jellyfish in Vietnam and watching a bull fight in Spain too. Bottom line is some experiences aren’t worth repeating. I was the first one to finish our hike that day and the first one to say I would never do that again. This is fantastic. You’re an incredibly descriptive writer and I enjoyed reading this entire post. I’m so envious that you’re able to tell stories in such detail about different places all over the world! This is written really well. It would make a great feature story. I love this blog!